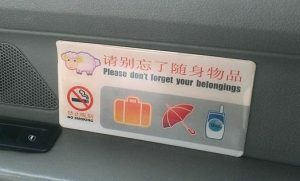 It’s good to see the transportation authorities finally doing something about the problem of sheep abandonment in taxis. Hopefully this will put an end to the awkwardness of having to hand a lamb to the driver and explain that it is not yours, it was there when you got into his vehicle. Not to mention that sinking feeling when you reach for your sheep only to realize that it’s sped off in the cab you just exited. With news this week of Stephen Fry walking a sheep across London Bridge and scammers selling sheep as miniature poodles in Japan, it’s none too soon that taxi companies are taking action to stamp out sheep abandonment before it takes root in Chinese cities and leaves all travelers thinking woolly.